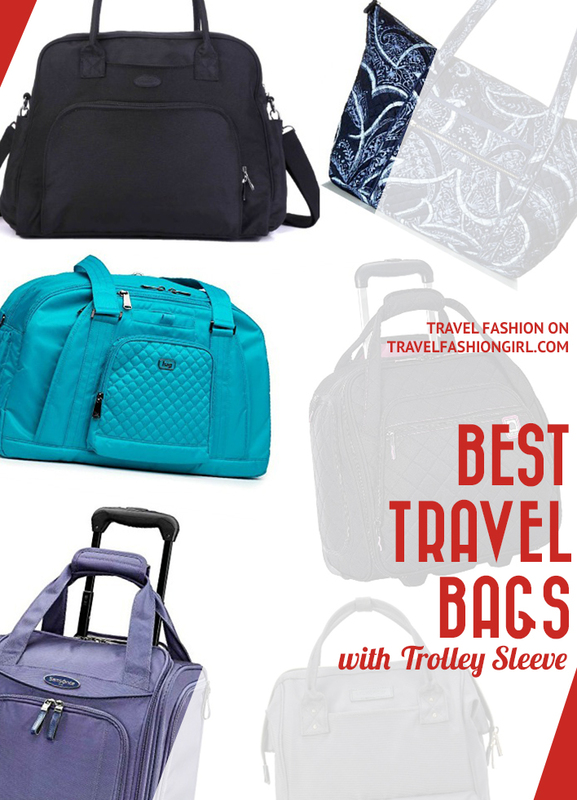 Home » Travel Products » What are the Best Travel Bags with Trolley Sleeve? We recommend the best travel bags with trolley sleeve, because a trolley sleeve is one of the most helpful features a bag can have for travel! You’ll never struggle in the airport again with these top picks. I’m looking for suggestions for a personal bag with trolley sleeve to slip over the handle of a roller bag. I usually take a backpack but I am looking for another option. What are your recommendations? What is a trolley sleeve on luggage? A trolley sleeve is a feature on a bag that slides over the luggage handle so you can keep your bag balanced on your carry-on or checked wheeled bag. If you’ve ever wanted to know how to attach backpack to rolling suitcase, a trolley sleeve is the answer! Instead of carrying a tote on your arms or wearing a backpack, you simply put the tote bag with luggage slide over the handle, allowing it to attach securely. From wheeled suitcases to backpacks and weekenders to totes — there are a variety of “personal item” travel bags with trolley sleeves. Our readers chose the best travel bags with trolley sleeve. Take a look at their top recommendations! This bag may not look like much, but it packs a punch! The Baggallini Avenue makes the best carry-on tote, with plenty of room for your personal travel accessories. Sounds like a good candidate for the best tote bag with trolley sleeve! Packing cubes help you organize and maximize your space! 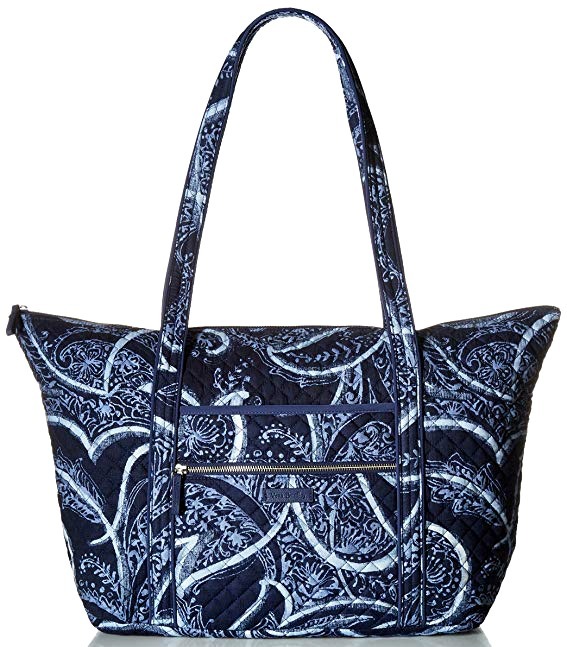 We love this Vera Bradley bag for its sophisticated style that can take you from the gym to the airport. With signature cotton construction, tons of organizational space, and, most importantly, a helpful charging port inside, this bag has it all for travel. With its add a bag sleeve, it connects easily to your carry-on suitcase or checked bag. If you need the best packable tote, read our list! 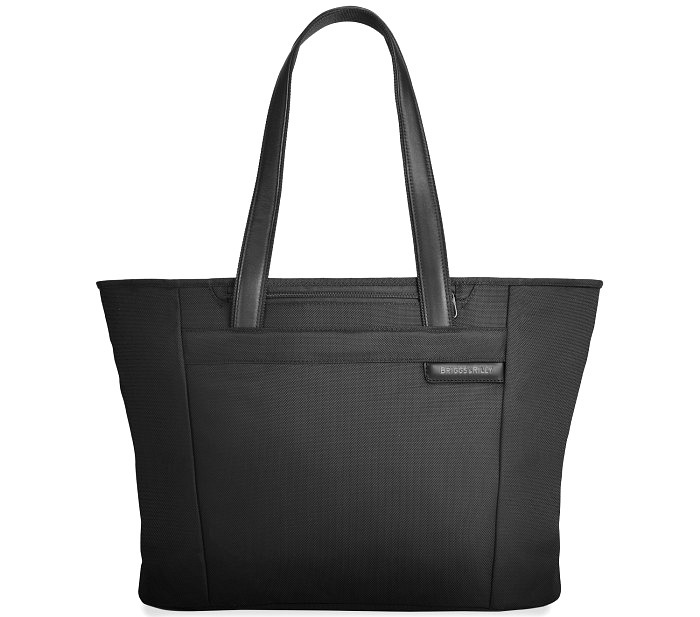 One reader favors her Briggs & Riley tote due to its roominess. This large travel tote with luggage sleeve is made from ballistic nylon, which provides the ultimate in durability. Comfortable and luxurious leather shoulder straps make this one easy carry-on. Plus, the dual purpose slip-through back pocket helps so that the tote bag slides over luggage handle for easy transport.The roomy main compartment allows the tote to be easily packed and organized, as it also has a zipper pocket and two elastic pockets to organize smaller items. Looking for new luggage? See expert recommendations! 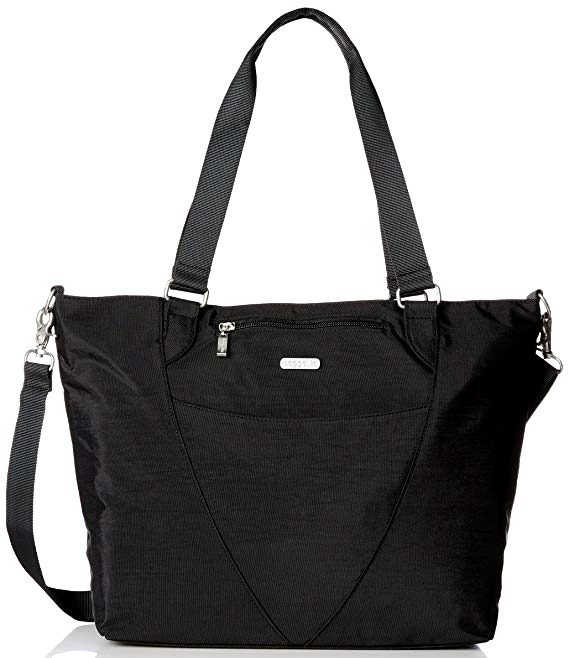 If you’re looking for a classic looking and cost-friendly tote, this ECOSUSI weekender travel bag is a great choice. 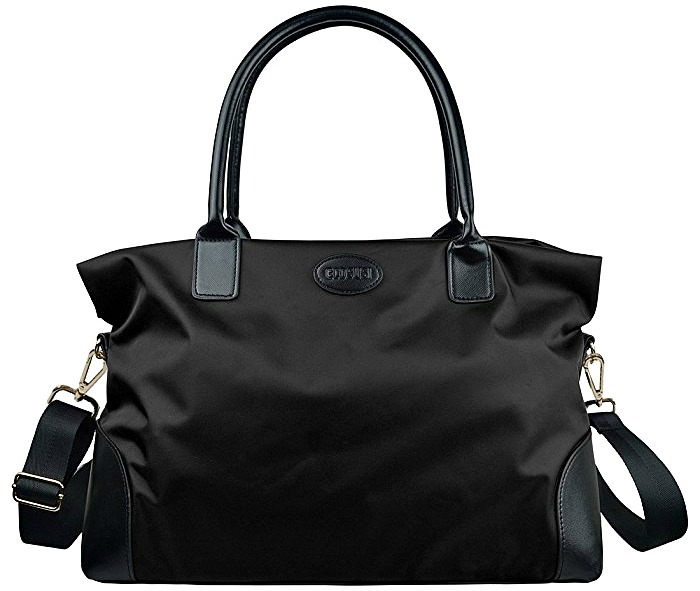 Made of water-repellent nylon fabric, this travel bag has secure double top handles and solid gold hardware. 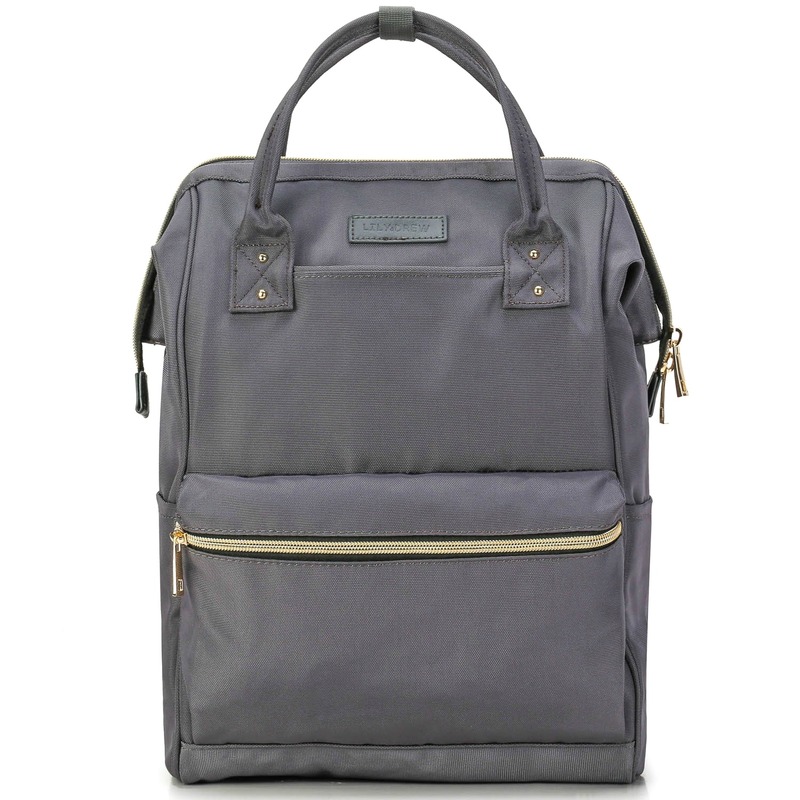 It also has an adjustable padded shoulder strap for satchel or cross body style. Plus, there’s a panel on the back so you can slide it onto your suitcase handles, which makes your travel easy and free from fatigue. This is one of the best tote bags with luggage sleeve. Here’s why you should travel carry-on only! The Lily & Drew Carry On Weekender is the perfect sized bag for your weekend trip. 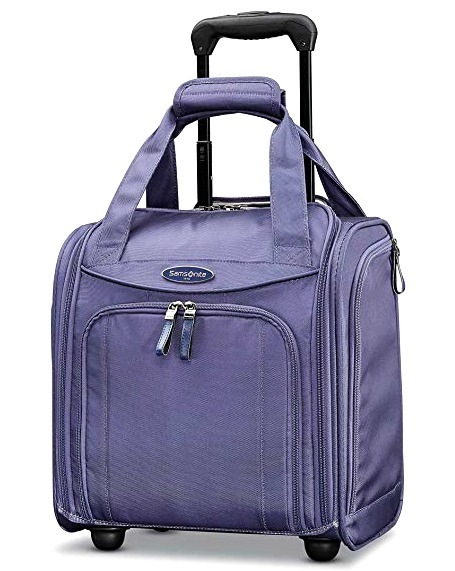 It has multiple compartments for organization, a trolley sleeve for easy transportation through the airport, both short and long straps for carrying on your shoulder, and it’s carry-on compliant! The main compartment of the bag also has five mesh compartments for ultimate storage capacity. It comes in a variety of stylish colors for every fashionista out there. 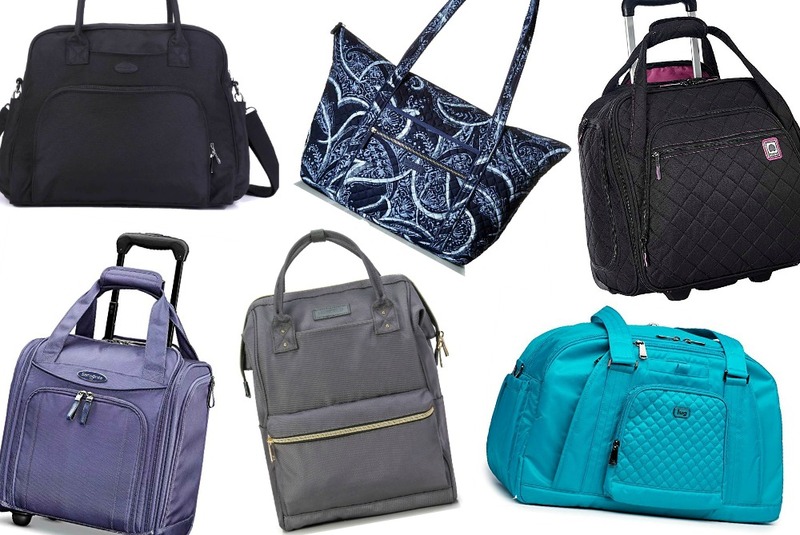 Read how to choose the best travel purse! 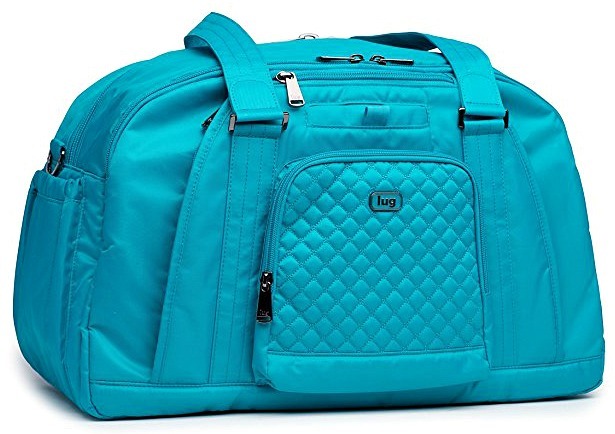 One reader calls this Lug bag a “great bag that checks all the boxes.” This bag has many compartments to make organized travel a breeze. 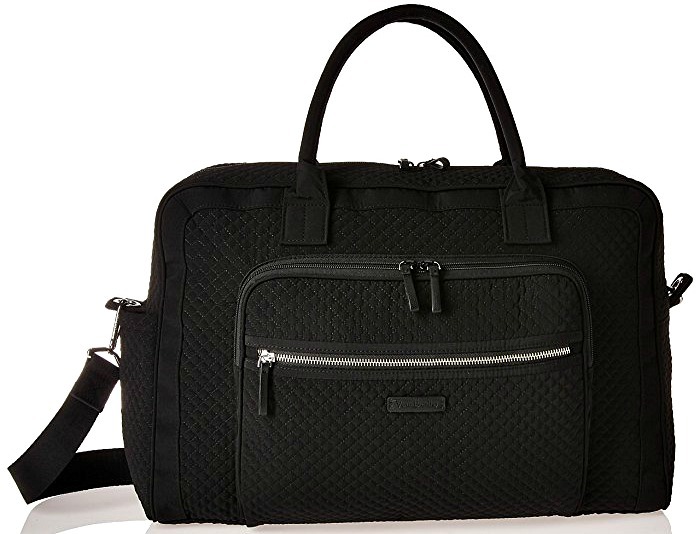 This weekender bag with trolley sleeve is packed with amazing unique details, such as a built-in jewelry/cosmetic organizer, quick access cell phone pocket, and ventilated mesh shoe compartment. For security, it has RFID protection, which helps prevent your credit cards from being scanned or stolen. Plus, the bag comes in so many fun colors, including bright teal and pink. Need to pack light, carry-on only? Watch this video! Our readers love Vera Bradley travel bags with trolley sleeve, and so many recommended the Iconic Weekender bag. This bag has a fully zippered front compartment and two back slip pockets, along with a wide opening with double zippers and a sturdy, removable base. Plus, it has a trolley sleeve to slip over your roller luggage. If you’re looking for a briefcase with trolley sleeve, this style bag would be a great option. Traveling with a laptop? Check out these business backpacks! This travel daypack by Lily & Drew is definitely one of the most stylish travel bags with trolley sleeves on our list. It comes in a variety of colors, and it has a chic look. The best part about this bag is that it’s actually a backpack with luggage handle sleeve! When you’re traveling, you can wear this bag on your back, and it will go well with any of your cute outfits from your capsule wardrobe. Then, when you’re running through the airport, just slip this backpack with luggage sleeve over your suitcase handle. Check out these cute backpacks for travel! And, the best part is that it’s a bag that slides over your luggage handle so you can take a regular size carry-on without needing to wheel them separately. 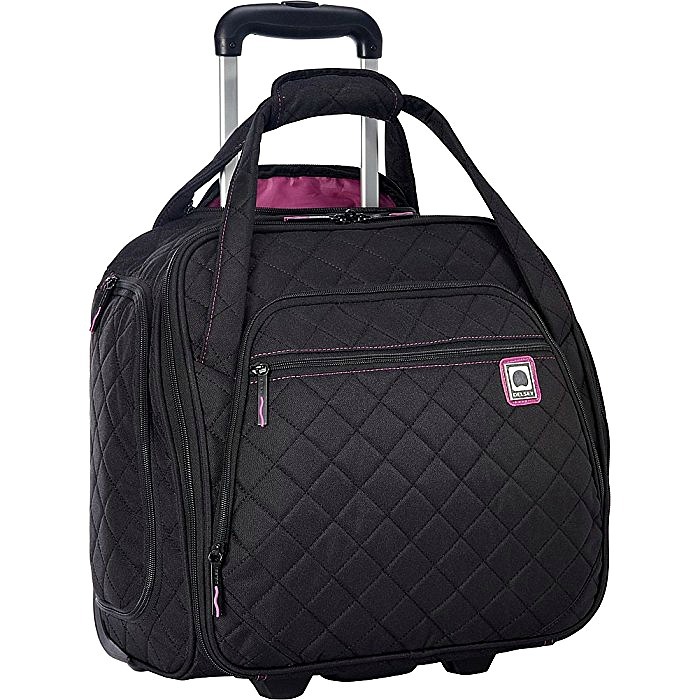 This tote is one of the best carry-on bags with trolley sleeve with multiple pockets for organization. The inside has a roomy main compartment with a foam padded pocket that offers protective storage for your iPad or laptop, interior pockets to organize toiletries, personal items, and small accessories, and side pockets to hold water bottles or magazines. A slip through band on the back allows this bag to be slipped over the handles of your upright luggage, too. Learn how to choose a carry-on personal item! The Samsonite Wheeled Underseater is a great compact option if you’re looking for the best travel totes with trolley sleeve. 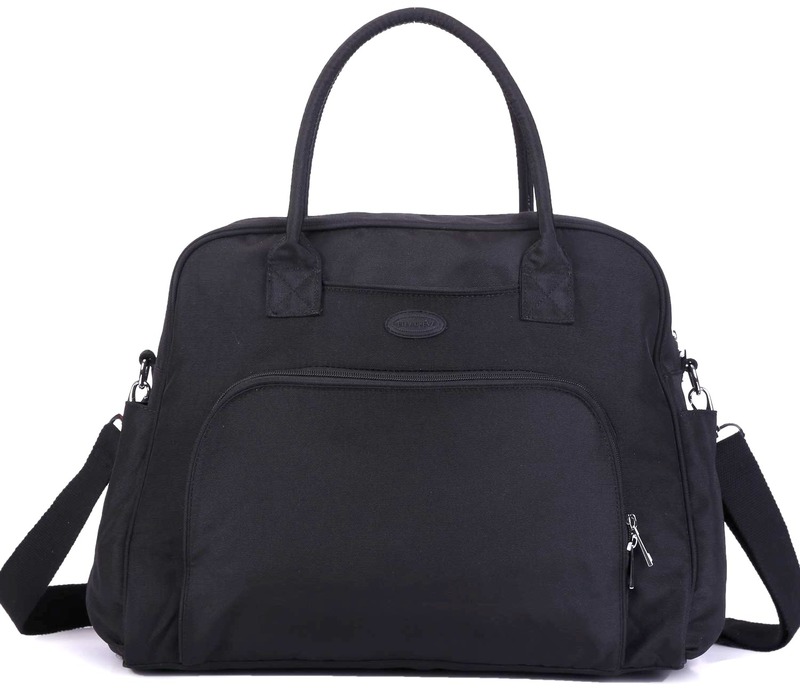 This bag can work as a carry-on and fits nicely under the airplane seat or in the compartment above. 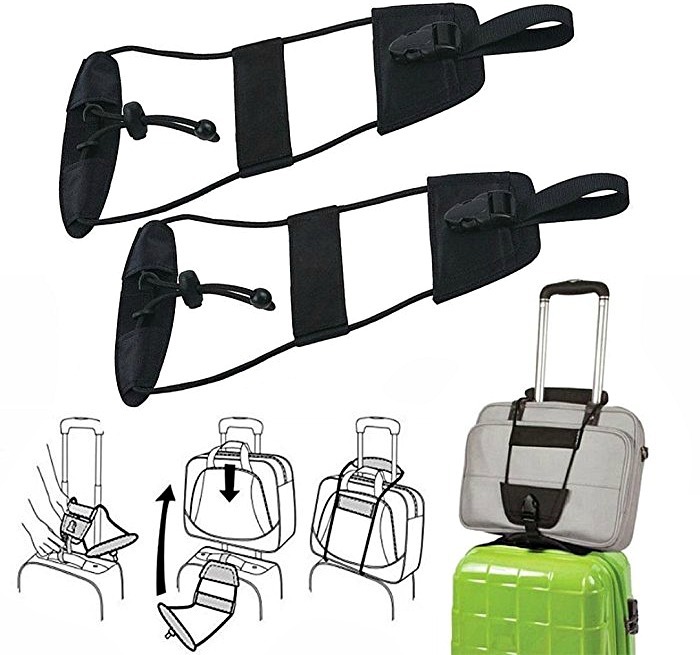 It has a pull up handle as well as a Velcro strap to make taking it on and off your luggage simple. This bag also comes in a variety of colors to match your luggage and keep you stylish on your travels! See our list of the best carry-on luggage! Have a travel bag you love but it doesn’t have a trolley sleeve? There’s a solution for that! Add a bag bungee, like this one from Travelon! With this bungee, you can connect two items as one. You can fix one bag, laptop case, or other item to your wheeled travel luggage handle. The key to simplified packing is to create a capsule wardrobe. What are your recommendations for the best travel bags with trolley sleeve? Share in the comments below! I hope you liked this post on the best travel bags with trolley sleeve. Please share with your friends on Facebook, Twitter, and Pinterest. Thanks for reading! I purchased my Vera Bradley Weekender based on feedback here. I’ve taken it on three trips. What I love about it is the ability to squish down for under the seat storage as long as I don’t overpack it. It’s a softside, so you can easily squeeze it in this bag size checkers if you need to. I bring it onboard along with my carryon and I’ve never been stopped. It is slightly larger than allowable personal bag sizes, so don’t let that scare you.